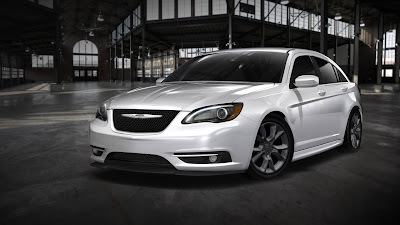 At the 2011 Detroit Auto Show Chrysler showed off a Mopar tuned version of the new 200 sedan dubbed Super S. the car featured a new grille, a lowered ride height, and a vented hood among other things. Following the launch of the Standard “S” line Chrysler plans to launch the Super S in Detroit this year, but thankfully this one appears to have left the vents at the Studio. The revised 200 Super S includes new ground effect, Satin chrome trim on the fog lamp housings, Tail light bar, and grille surround, the actual grille is black chrome mesh, like that of its larger stablemate, the 300. Mopar also added Black Chrome badging, new wheels, diffusers, and an integrated spoiler. To make Chrysler’s entry level car a little hotter Mopar threw a few things in under the hood, including a cold air intake, a revised suspension, and a new exhaust system. Perhaps this will help silence a few of the 200’s Critics, I personally think the 200 is a good looking car. This may help sales along a bit, I can’t wait to see this package on the convertible variant, that way it doesn’t have the Sedan’s awkward greenhouse, even though this kit definitely makes it look better proportioned in my opinion. I just read Car & Driver's coverage of Detroit auto show and this caught my eye as well. The car (200) does need some mechanical improvements to match the visual improvents Chrysler did to the car. Re-skinning a Sebring really wasn't enough. I did drive a late model Sebring convertible (while in Daytona for the 500) and it was horrible to drive. Granted rental cars get abused but other than the hard top good looks....I found nothing desirable about the car. Now that Fiat even owns a larger percentage of Chrysler ( thanks to the Dart being announced as a40mpg offering..fulfilling Fiats obligation to gain a larger percentage) they may be able to leverage their small car know into Chrysler's intermediate offerings. Chrysler has done well with the 300 and Jeep Grand Cherokke brands....they just need to keep the momentum. Have you acutally been in the new 200? I wasn't too enthusiastic about it when I first saw it, but the interior is quite an opinion changer, its fantastic!